"Please do it every year." These are just two of the many positive comments submitted by pastor's spouses who attended Breakaway on April 15th-16th. Over 120 spouses traveled from as far away as North Carolina, Texas and North Dakota to attend this year's gathering at the Wesleyan Church Headquarters in Fishers, Indiana. Pastor's Spouse Connection and the Department of Education and Clergy Development have recently partnered to provide gatherings, ongoing connections, and resources for the spouses of pastors. In 2014, Pastor's Spouse Connection (PSC) began because of the belief that the spouses of pastors have a unique role. Being married to a pastor is different than being married to teachers, nurses, or mechanics, and pastoral ministry affects every spouse differently. Some spouses desire a co-ministry role while others remain supportive yet have separate vocational or life callings. PSC exists to provide connections among people who understand the unique joys and challenges of being a ministry couple or family. Thriving in life and ministry requires a strong connection with God and with others who are willing to offer encouragement and support. To that end, learning opportunities at Breakaway included the topics of healing from ministry hurts, spiritual coaching, marriage, parenting, friendships, and a round-table session specifically for male spouses. From large group corporate worship, to individual prayer and solitude, the Holy Spirit's presence was palpable. 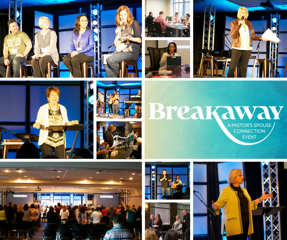 A highlight of Breakaway for many spouses was the testimony and teaching Dr. Joanne Lyon. Having lived a season as a pastor's wife, Dr. Lyon is perfectly equipped to provide encouragement for today's pastor's spouses, and she did so in a beautiful and powerful way. Although this inaugural event was a bit of an experiment, the overwhelmingly positive response from attendees indicates that there will be more to come. The leadership team, Amy Luchetti, Sharon Drury, and Marietta Williams (along with their teams of fellow volunteers), has big dreams for ways to continue to accomplish the PSC mission of inspiring, connecting and supporting the spouses of those in ministry. Providing regional versions of Breakaway as well as building and resourcing online connections are two goals they hope to see accomplished in the future. Are you the spouse of a pastor? Do you know the spouse of a pastor? Disappointed that you missed Breakaway? There are several opportunities to connect online. Visit www.pastorsspouse.com to learn more, or check out the Facebook page- Pastor's Spouse Connection.